Pottukadalai Urundai or roasted gram balls is a traditional South Indian sweet. It is very healthy, easy to make and tastes very delicious. It is high in protein and fiber and is low in fat. It can be had as a snack any time of the day. 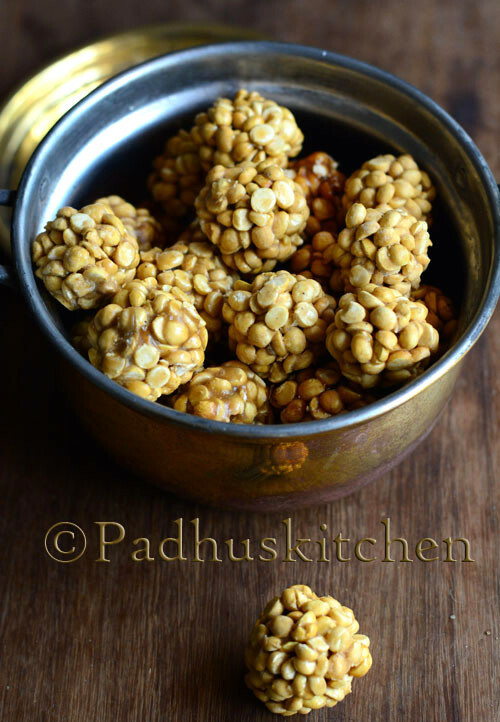 Today we will learn how to make pottukadalai urundai with jaggery following this easy recipe. Roasted gram (also known as pottukadalai or chutney kadalai) should be crisp. Avoid using old stock. If required dry roast it slightly until hot to touch. Heat 1/3 cup of water, add jaggery and stir it to dissolve. Remove from heat and strain it to remove impurities. Take a kadai, add the filtered jaggery water and boil it. When it starts boiling, add a tsp of ghee, cardamom powder and dry ginger powder. Boil until the jaggery syrup thickens and reaches soft ball consistency. To find out the soft ball consistency - take a small bowl of water, add a tsp of jaggery syrup to it. The jaggery syrup should not dissolve. If you are able to collect it and make a soft ball, it is the right consistency. Switch off the heat and add the pottukadalai or roasted gram dal. Mix it well so that it is well coated with the jaggery syrup. Once the mixture cools slightly, grease your hands with ghee or dust your hands with rice flour and make balls out of the mixture when it is warm. If the mixture cools, it will harden, so make balls when the mixture is warm. In case, if it hardens, you can reheat it slightly. Storage and shelf life - Store it in an air tight container. Stays good for 15-20 days at room temperature. You might love my Maaladu Recipe prepared with roasted gram. Gonna try this today..will keep you posted! Going to try today.Thanks for the recepe.